With warming, stimulating, and disinfecting actions, Juniper Berry herbal extract has many medicinal benefits. Juniper Berry promotes urine flow and helps to clear the kidneys, bladder, and prostate of toxic wastes, while at the same time helping to combat urinary tract infections in both men and women. Juniper Berry's warm, aromatic qualities aid digestion and also help to relieve gout, arthritis, rheumatism and the build-up of uric acid in the joints or painful joints. Apart from that, it is also used for expelling worms. Juniper Berry tincture cleanses toxins from the blood for the proper functioning of the various organs. Being a powerful antiseptic, the Juniper Berry may be applied to slow-healing wounds in a salve. Its astringent properties help for treating toothaches and strengthening the gums. Juniper Berry is excellent for different skin conditions such as dandruff, athlete's foot, acne, psoriasis and weeping eczema. It is one of the most important herbal remedies to relieve stress, nervous tension, anxiety and mental fatigue. Along with all its other health benefits, these berries have been used effectively to assist in losing weight naturally. Juniper Berry extract is a well-known diuretic. Perhaps this is the reason why they are considered to be one of the best herbal remedies for kidney and bladder conditions. The detoxification properties of the Juniper Berries make the kidneys work faster and aids in getting rid of toxic waste from the body effectively. By clearing and disinfecting the urinary tract it may help to prevent urinary tract infections, urinary tract cystitis, and urethritis. They are used between flare-ups in those with frequent infections, but not in cases of a chronic bladder infection. If you have a raging infection, the herb could be too stimulating for the organ. Juniper berry tincture should be taken only in small, cautious doses, and only under the supervision of a health practitioner. Juniper increases the filtering of waste products by the kidneys and has been found to be helpful for dissolving kidney stones, expelling prostate sediment and gallstones. Because Juniper has been indicated for chronic conditions associated with debility and lack of tone in the tissues. It is most often used for treating the elderly or those with chronic disease. Both the aging process and prolonged disease have been associated with the loss of tone in the tissues and organs. Juniper is a natural storehouse of insulin, which can be beneficial for diabetics, especially for those who are suffering from pancreatic damage. It is also believed to have the ability to restore the pancreas when no permanent damage has been done. Diabetics must be careful when using this herbal tincture as it can raise glucose levels in the body. Juniper helps to tone the digestive system and has a soothing effect on the stomach. Herbalists use the extract to calm indigestion, heartburn, cramping, colic, belching and flatulence. It is also believed to enhance the appetite which can be helpful in cases of anorexia. Juniper acts as a stimulant to improve digestive function, helping increase the flow of digestive fluid and eliminate excess gas. Juniper's antiseptic properties help aid in the removal of waste and acidic toxins from the body. These properties may help in stimulating a fighting action against yeast infections and bacterial infections. 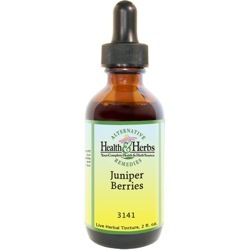 Juniper Berry herbal extract has been known to have powerful anti-inflammatory properties. Juniper extract is an excellent herb for those who are suffering from rheumatism, arthritis and gout and other conditions involving painful joints. Joint related diseases occur because of fluid retention around the joints. The Juniper berry, with its diuretic action, has been found to help relieve the pressure considerably. In addition to taking this herbal remedy orally, it can be used in a tea or salve and applied over afflicted areas to relieve sore, inflamed and painful muscles and joints. Due to their exceptional performance as a diuretic, Juniper Berries can aid in weight loss, with the increased urination leading to a reduction in water weight. Juniper's ability to expel excess water also makes it an effective natural treatment for edema, or swelling of tissue caused by fluid retention. Menstrual cramps are the most troublesome aspects of a woman's life, but these can reduce significantly with the help of Juniper Berry supplements. Many herbalists have used the Juniper Berry to improve the uterus tone and to help those who have slow or late starting periods. People facing water retention problems may feel a lot of relief with the use of this herb. Because of the diuretic effects, the urine flow is increased and has the smell of violets. Juniper tincture has been used to induce labor but should be used only be used under the direction of your healthcare provider. And women who wish to become pregnant should not take Juniper Berries, as they can cause a reduction in fertility. Juniper Berries are a great source of vitamin C and flavonoids. These properties are antioxidants, which help protect the cells from damage by harmful toxins and free radicals. This can also help to prevent premature aging. It is known to exfoliate the skin and help clear clogged pores as well. It allows the skin to breathe, speeding up the metabolism within particular tissues. This herb can be very helpful in the treatment of acne, eczema, psoriasis and other skin conditions. You may feel a warm, irritating sensation when it is applied to the skin. You can dilute the concentration of the application until it feels comfortable, then, if necessary, increase the amount of extract. Juniper is valuable for respiratory infections and congestion because of its volatile oil in its berries open bronchial passages, it is a natural expectorant and helps expel mucus from the lungs and nose. It is highly recommended in catarrhal conditions and has helped to ease breathing and treat bronchial asthma, emphysema, sinusitis, head colds and other viral infections. It can also be used topically in a salve or poultice for lung congestion and coughs. Therapeutic actions: Antiseptic; Aromatic; Anodyne; Carminative; Decongestant; Diaphoretic; Diuretic; Digestive; Emmenagogue; Rubefacient; Stimulant; Stomachic; Tonic. Nutrients: Calcium, chromium, iron, magnesium, manganese, niacin, phosphorus, potassium, selenium, silicon, zinc vitamins A, B1, B2, B3 and C.
Drug interactions: Interacts with loop and Thiazide diuretics, Spironolactone, Triamterene. Ingredients: Juniper Berry, Structured Water, 20% Alcohol. Non-Alcohol: Juniper Berry, Structured Water, Vegetable Glycerin. Contraindications: One should be extremely careful with the dosage and its consumption. The USFDA does not recommend this herb as safe, and prolonged use (more than a month) is not recommended, as it may cause kidney damage. If kidney disease is suspected, Juniper berries may over-stimulate the kidneys and adrenals and should be avoided. Pregnant women should not use Juniper Berry because it stimulates the uterus and may cause unwanted abortion. Women who are attempting to get pregnant should avoid Juniper, as it can result in lowered fertility chances and it causes uterine contractions. Juniper should not be used in cases of heavy menstrual flow, and the herb may interfere with the absorption of iron and other minerals. Some people may have allergic responses to Junipers, so test on a small area of the skin. The oil of Juniper should never be used on an open wound, as it could cause swelling and irritation.